Do you post the nutrition facts? Am I missing them? No, I’m sorry. I do not post nutrition facts. Great recipe! So quick and easy but sooo yummy – perfect for when I am low on time but still want filling, savory comfort food! 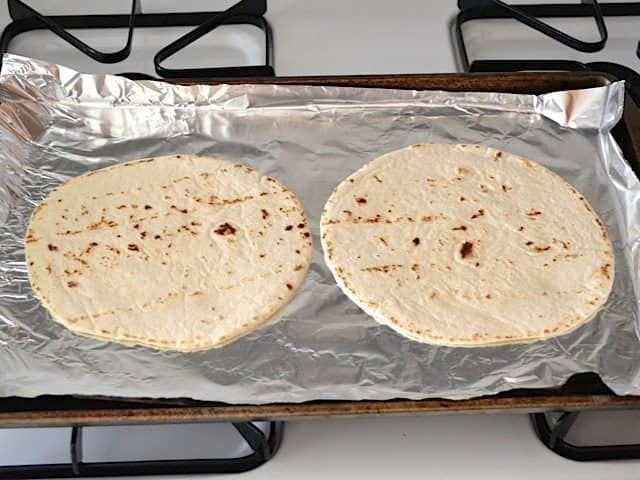 I used a toaster oven, and the tortillas seemed to crisp a bit faster than the 5 minutes, so if you go that route keep an eye on them. I live in a small village in Spain, so I needed to make some substitutions. 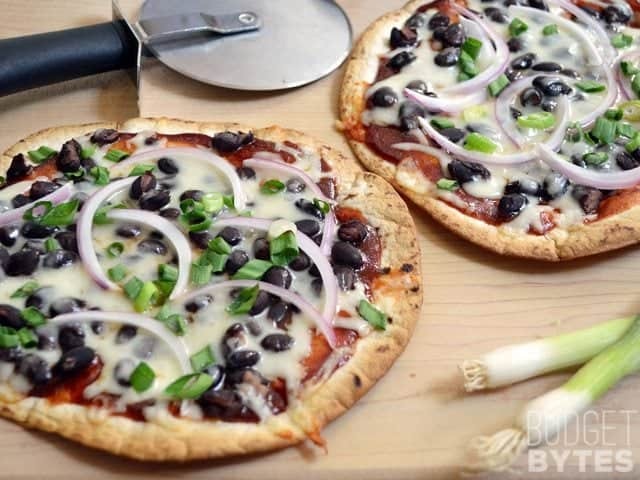 I used mozzarella cheese, Spanish yellow onions, and red beans and it was still delicious! Will make again! Great recipe! Two questions. 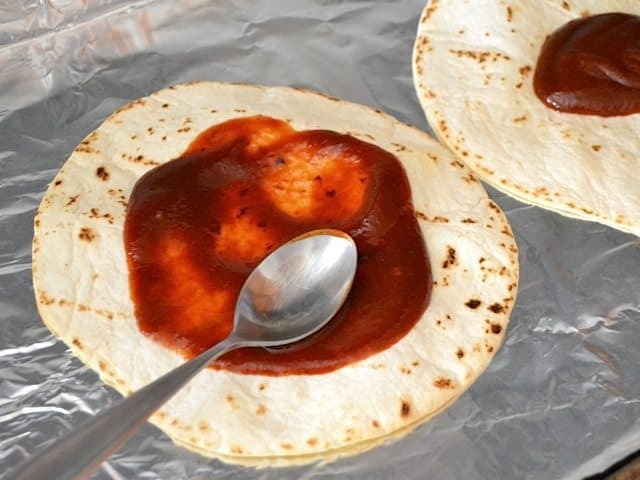 Can BBQ sauce be switched to tomato sauce? Can avocado (or something else) be substituted for cheese? We don’t do dairy in our family. Thanks in advance! Sure, you can really put any old thing you want to on these :) Be creative and have fun with it! Yum! These were quick and delicious. Great vegetarian option too. My fiancee loved them too. I just made these for lunch, and holy cow, they were amazing. We had tacos the night before, so I made sure to put some leftover tomato, avocado, and corn on them. I also sauteed the red onion before baking. They were phenomenal. 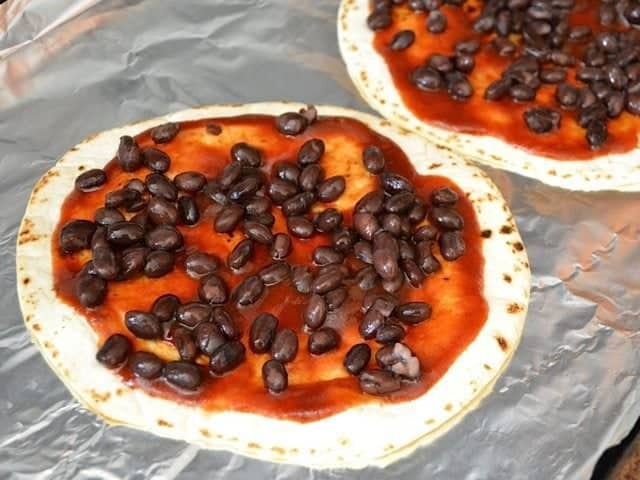 I can already tell, since I only used some of the black beans, that I will be making these again tomorrow. Thanks so much! Love your site and this recipe! Thank you! These were ahhhhmazing! I’ve already tried different toppings. 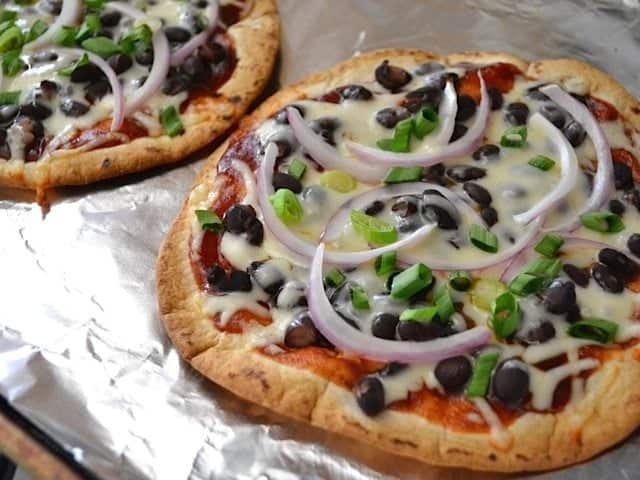 How did I never know about the tortilla crust! 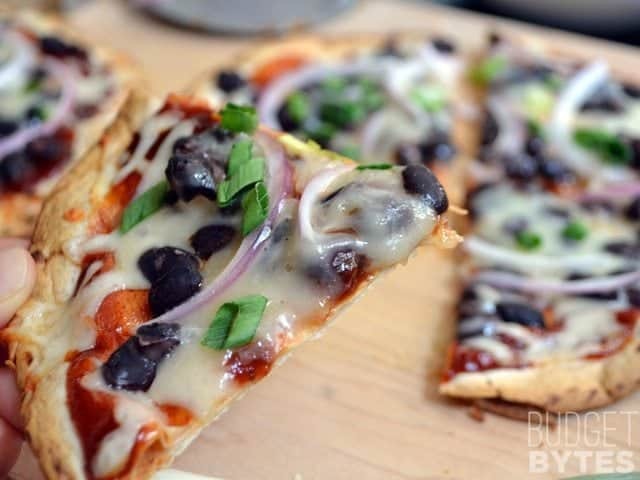 Just got done making these (w/ my crockpot black beans also) and they were awesome! I have made sooo many delicious things from your blog…I love it. Seriously, I have tried at least 30 of your recipes, u rock! So good! My first batch the tortillas puffed up HUGE, and couldn’t be flattened without breaking, so I tried it again with poking a few little holes in each tortilla first with the tip of a knife – worked great! This is going to be one of my staples soon, I can tell. 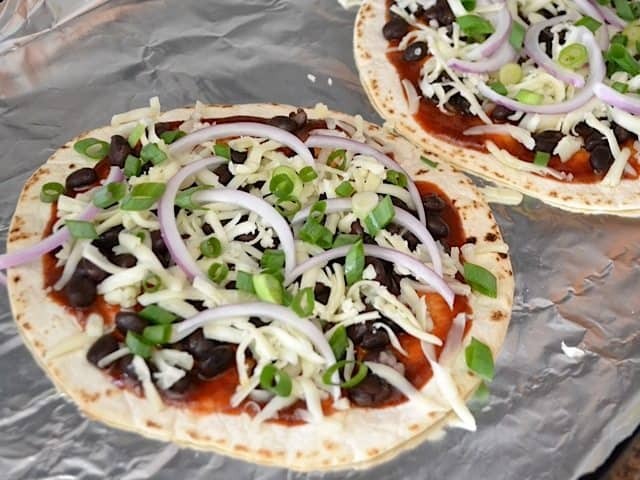 I made this once with two pizzas, then put the rest of the ingredients in a freezer bag (beans, sliced red onions, sliced green onions) and into the freezer. The next 2 nights, I made the rest of the pizzas. 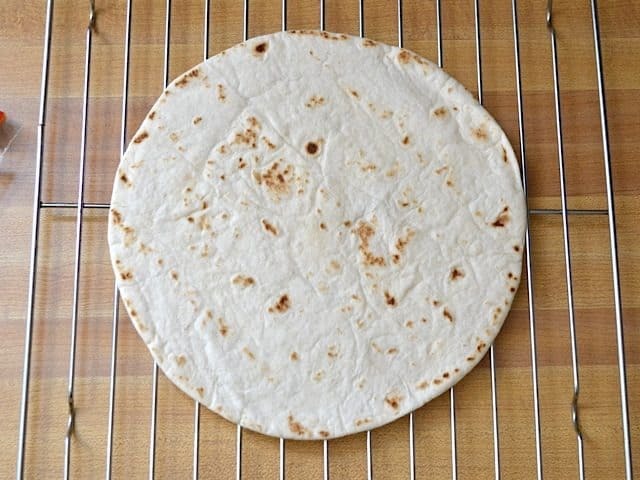 I love how crispy your tortilla got! I make barbecue pizza frequently with pepper jack, mushrooms and artichoke hearts. 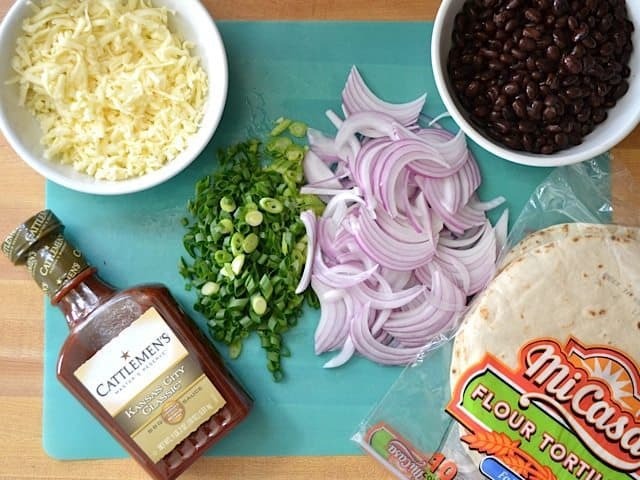 I hadn’t thought to use black beans — looks delicious! 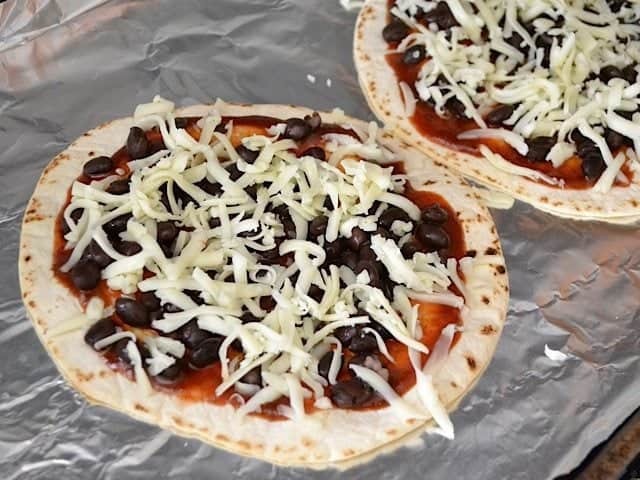 I really liked the whole concept of a quick and easy pizza using a tortilla in place of pizza dough. 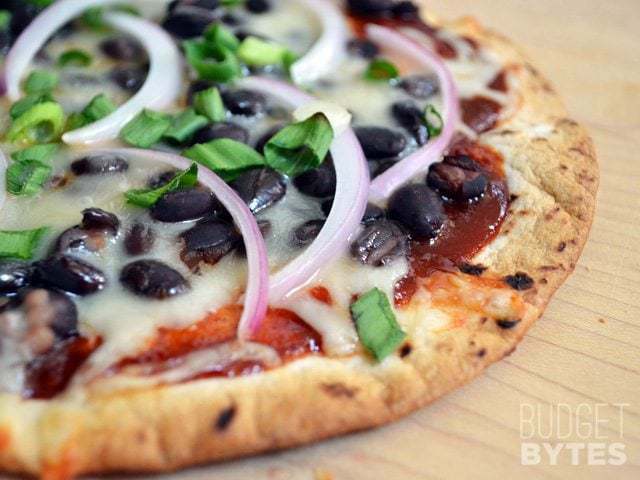 As a vegetarian, I am a little jealous that there are never BBQ pizza toppings for vegetarians so I really like the idea of combining black beans with BBQ sauce. My husband took it one step further and put cooked chicken on his and I think he liked it a bit more with that on it. I think if we had a better BBQ sauce (we bought the one that was on sale and we realized why it was- blech), this would have been a much better dish over all for us. 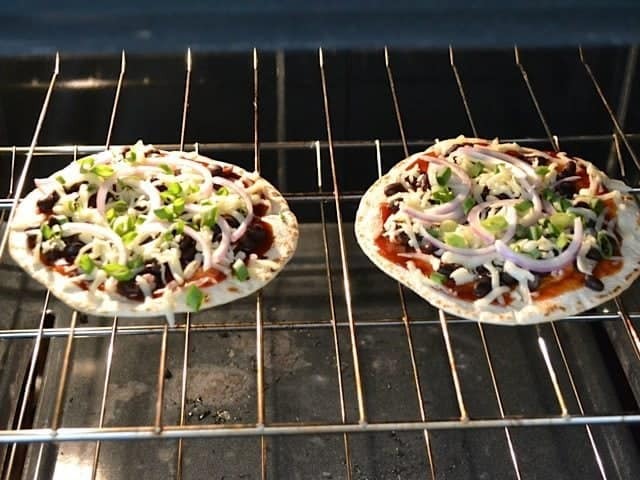 You can also make these in the toaster oven, so you don’t end up heating up the whole house b turning on the oven. 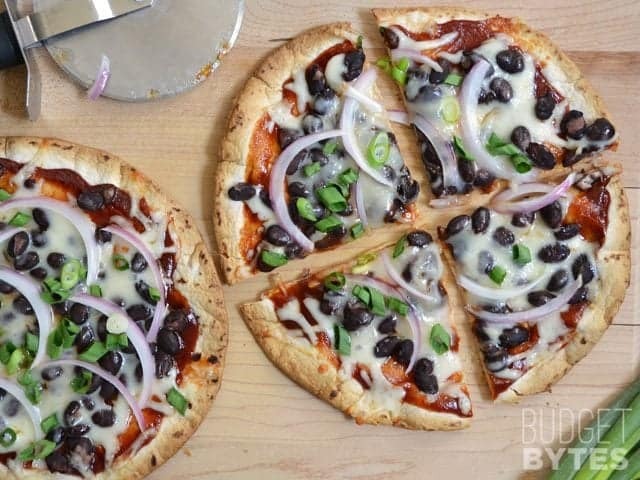 In response to the comment about there not being a vegetarian version of barbecue pizza, I made a fantastic one last week from the blog Cookie and Cake. You’ll have to google the exact address for the site but that blog has a ton of great recipes too. I was wondering if it was ok with you if I put pictures of your food on my tumblr? I would of course always link back to the original post. If it weren’t for you, I’d probably die a horrible McDonald’s-related death. Yes, that is fine as long as the whole recipe is not posted. Just leave a link for the readers to follow in order to access the recipe. Thanks!